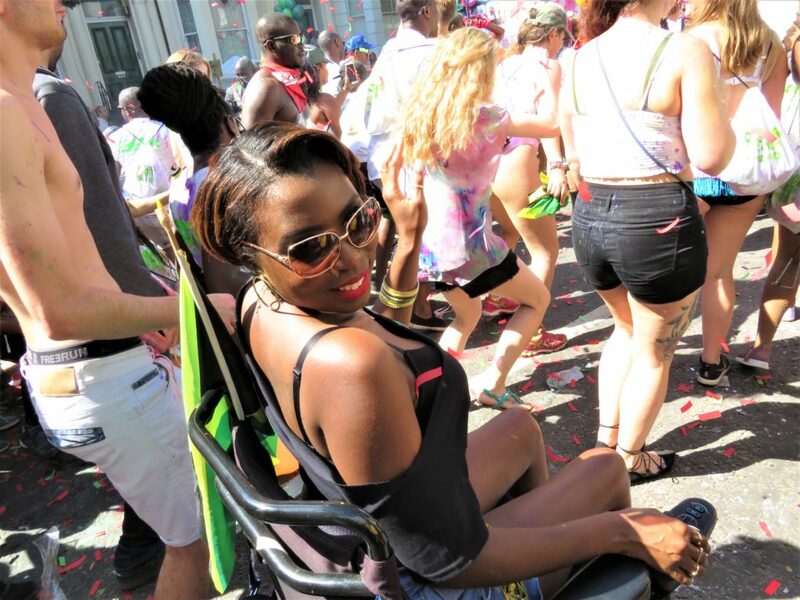 I am a huge fan of the Notting Hill Carnival, it’s the last weekend of the summer, and I have been going since I was a young child. 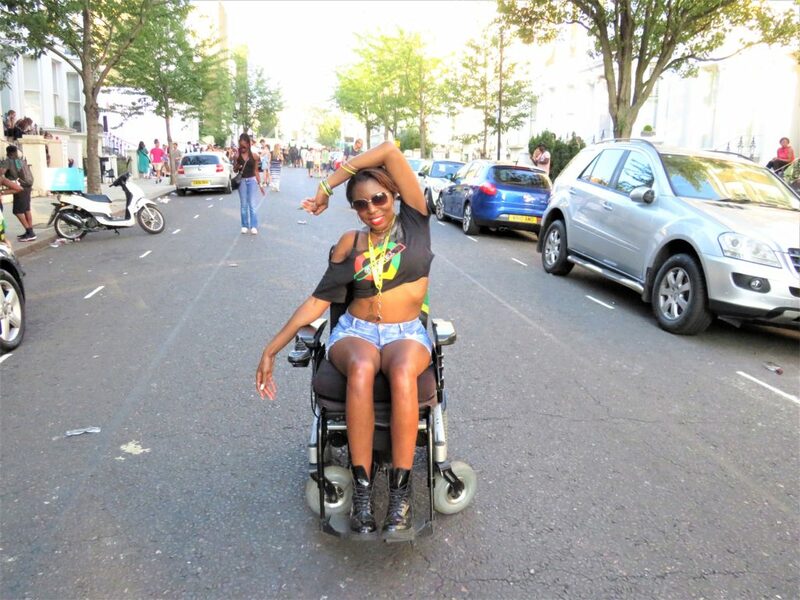 Leading up to the Carnival, Notting Hill would be buzzing with the anticipation, I would usually have my outfit sorted from the week before and the week of carnival I would cook loads of vegan gluten free Jamaican food for the after-carnival feast that occurs in my house. Understandably, this year is different to other years gone by. 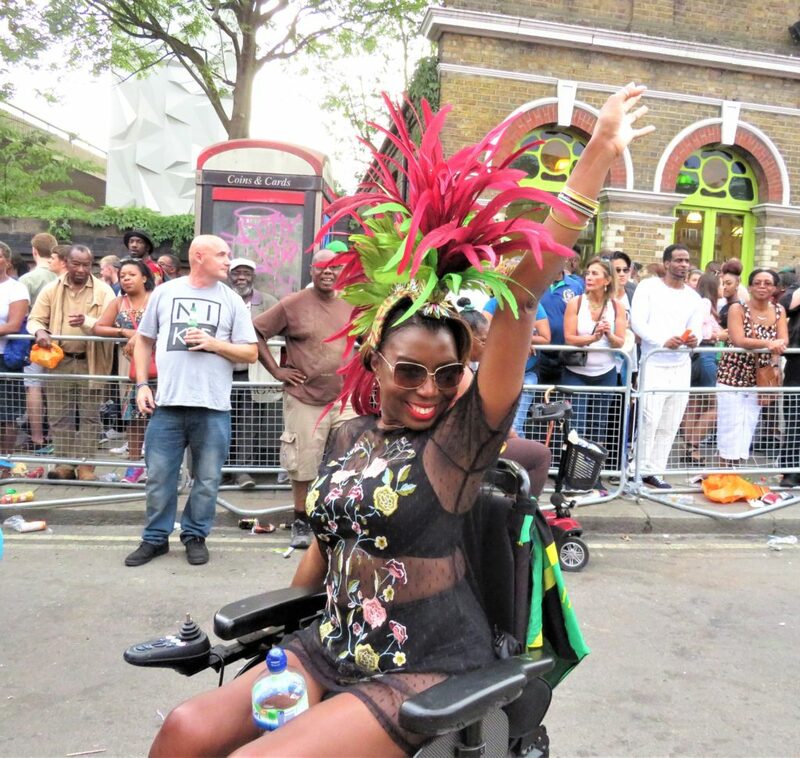 After the tragic Grenfell Tower fire, Notting Hill was not gripped in carnival fever, I had not sorted a carnival outfit and I was certainly in no mood for cooking. 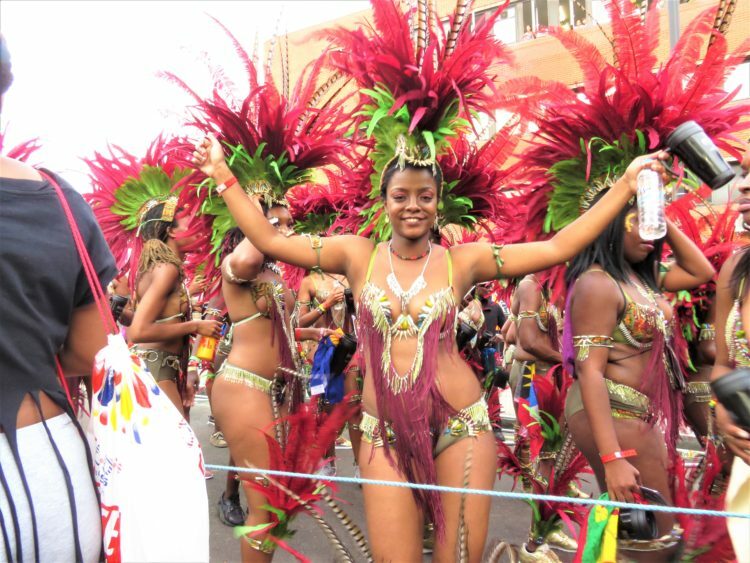 In fact, I had no intentions of going to the carnival this year at all, I simply was not in the mood. 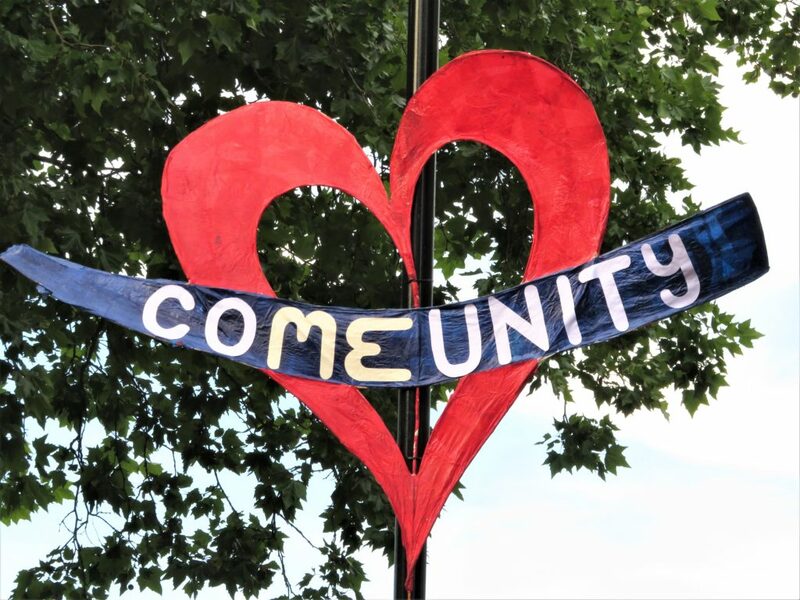 As I have said before I live 2 ½ streets away from Grenfell Tower seeing what’s left of the building every day would do that to you, plus the area is very quiet because the community is grieving. 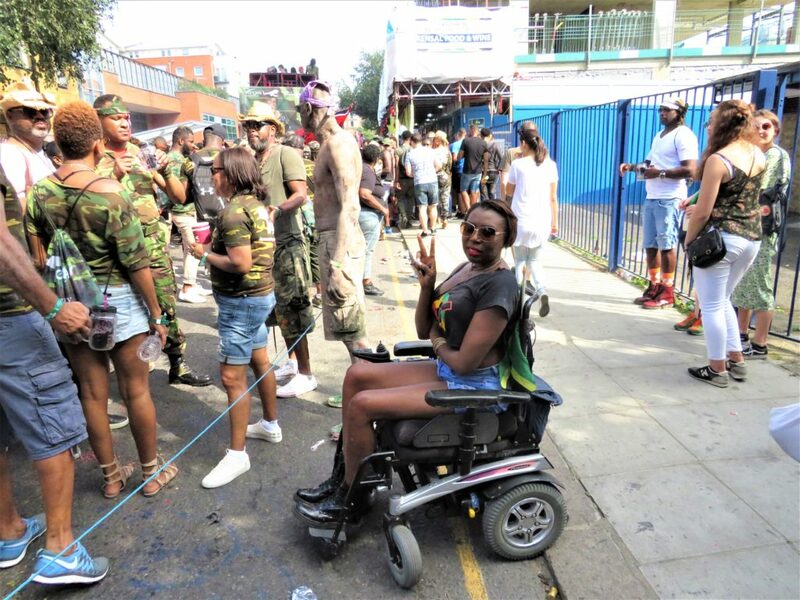 Some people in the community like myself weren’t up for carnival this year and some wanted/needed it to happen, but it had to be respectful to the lives lost and survivors of Grenfell. 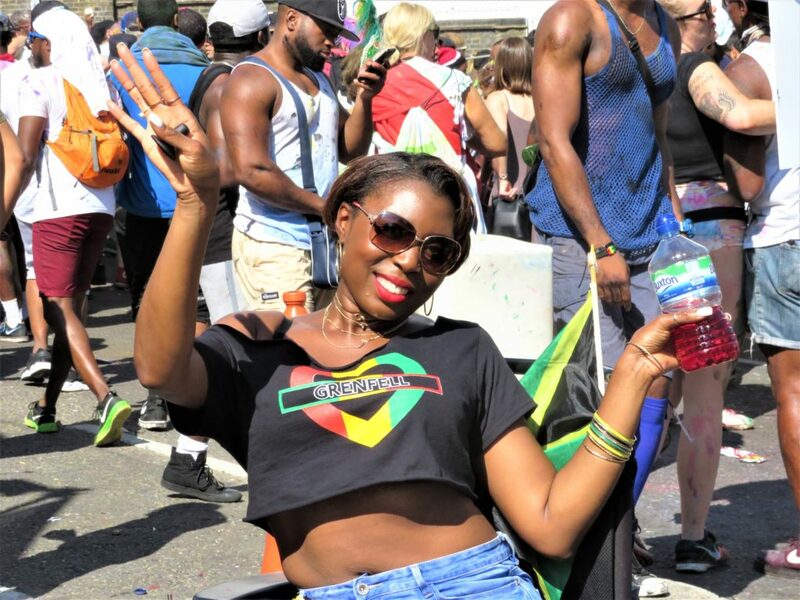 I was listening to the radio 3 days before Carnival and I heard a Calypso song, just hearing that song had me looking in my wardrobe for what I could wear and at that moment I decided I would go on the Sunday. 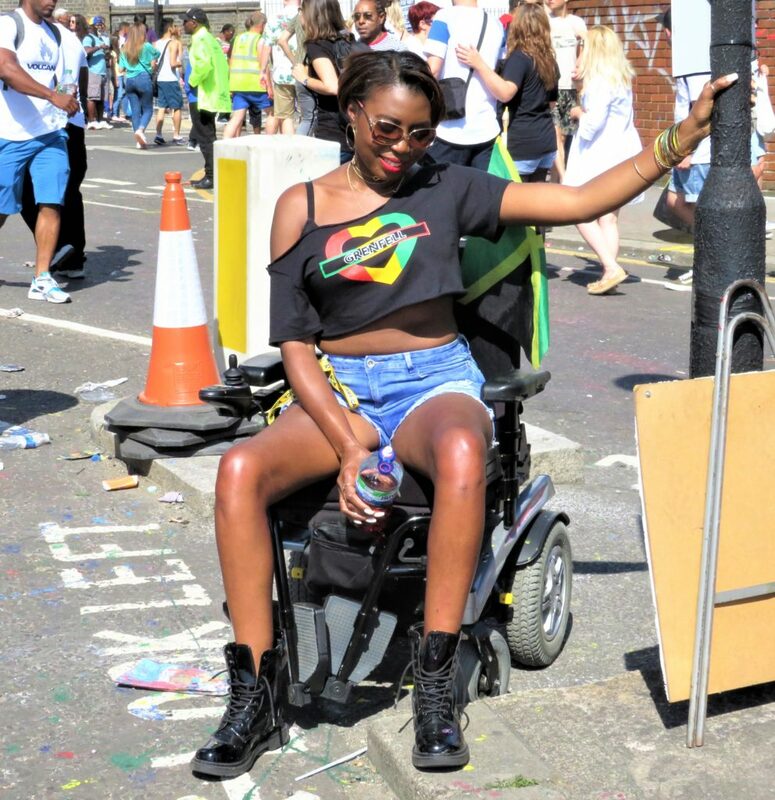 I saw on love 4 Grenfell Instagram page they were doing a red, gold and green carnival edition Grenfell Tee, and I instantly thought I need to get one. So, I went to Portobello Road market where they had a stall on the Friday and Saturday and got one for myself and another for my boyfriend. 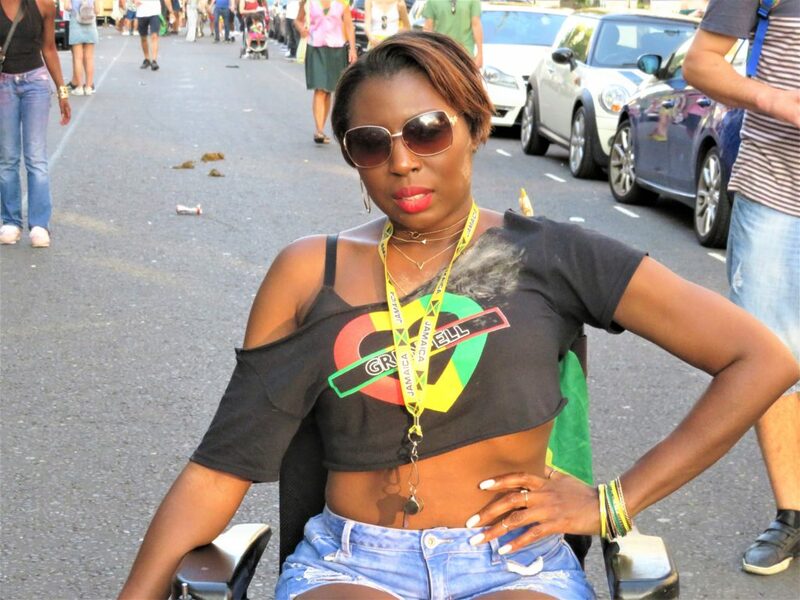 I then went home cut some denim shorts shorter and customized my t-shirt, I was now ready for Carnival. On Carnival Sunday, we left out to go Carnival around midday. 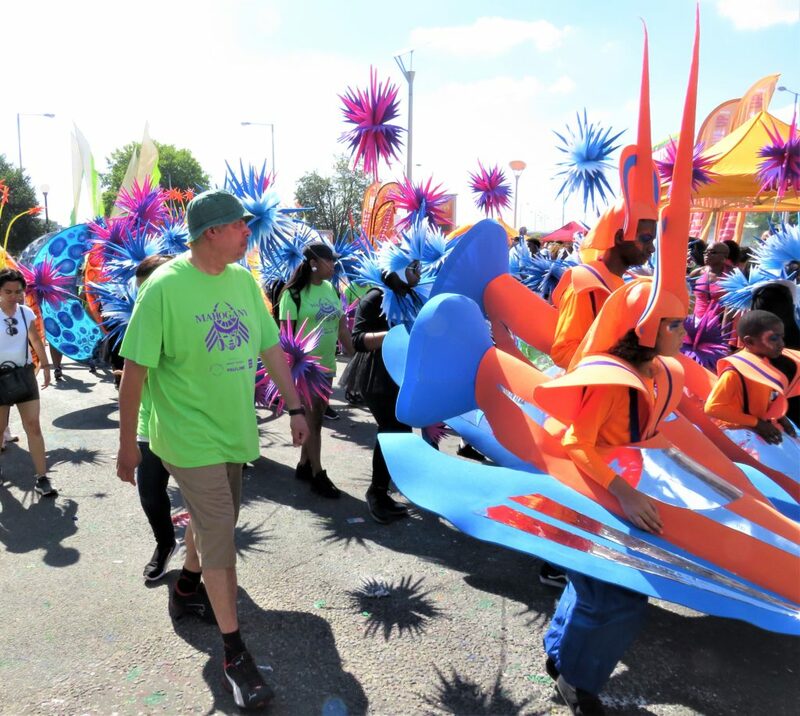 The weather was a gloriously hot and sunny 26c it was perfect carnival weather and the best we had in years! 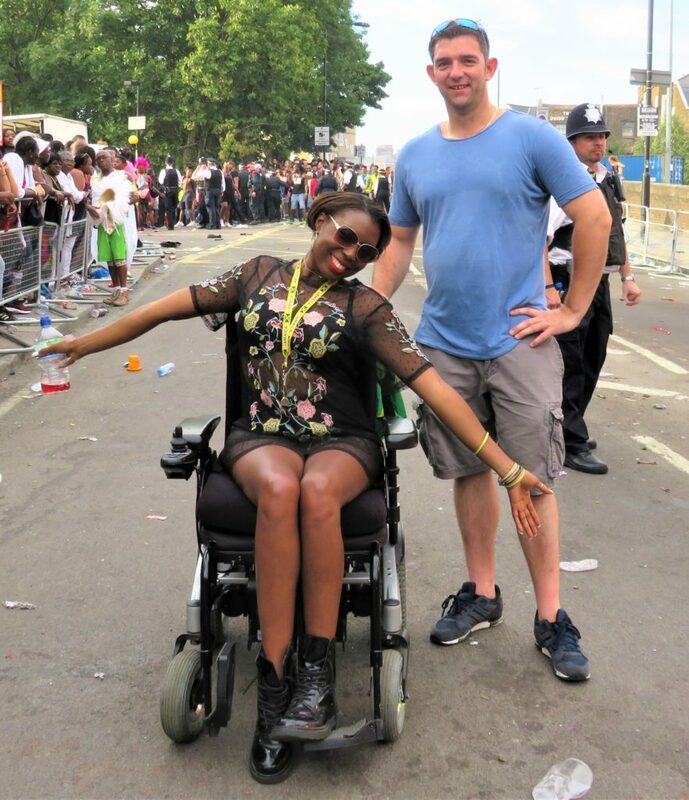 My boyfriend and I headed towards Ladbroke grove to where the carnival procession was. 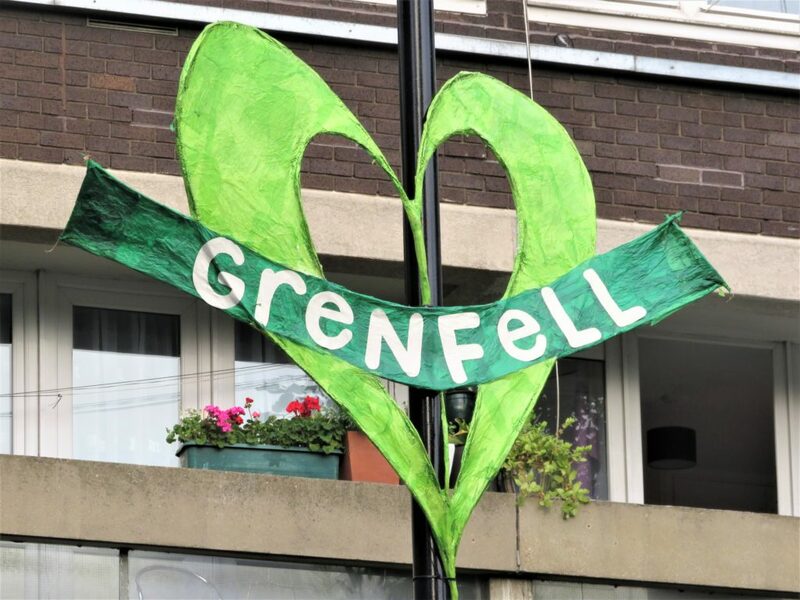 We had to go a different route than we normally go, as the roads around Grenfell were closed off and manned by police to protect the site, as they didn’t want it becoming a tourist attraction. 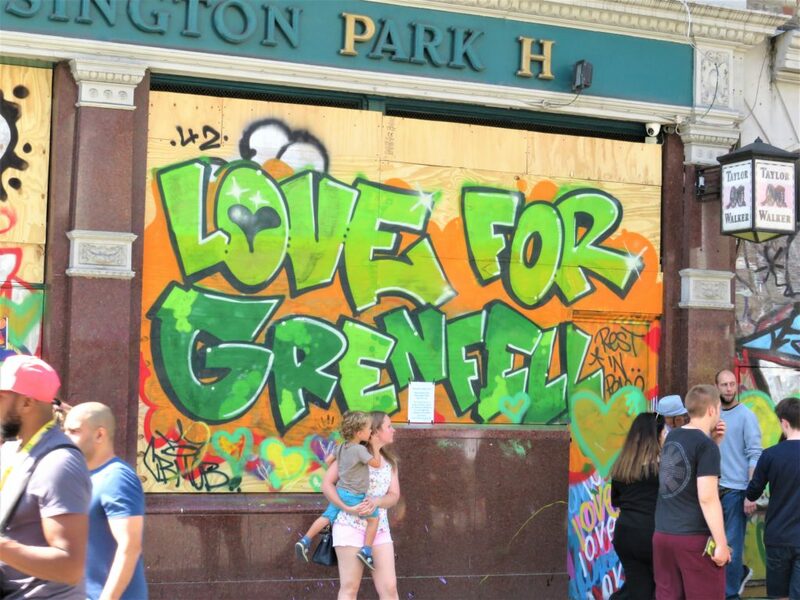 There were also posters that had been put up by Carnival organisers expressing the wishes of the community, kindly asking carnival goers not to take to pictures or selfies of Grenfell Tower. 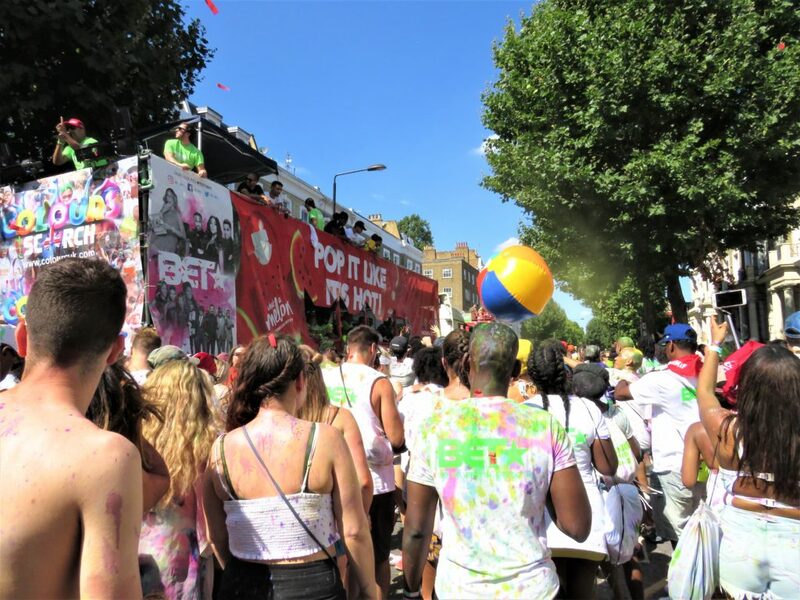 Our normal place to watch the floats go by is the corner of Elgin Crescent and Ladbroke Grove, but this year they had a quiet zone starting at Elgin Crescent until Cambridge Gardens. 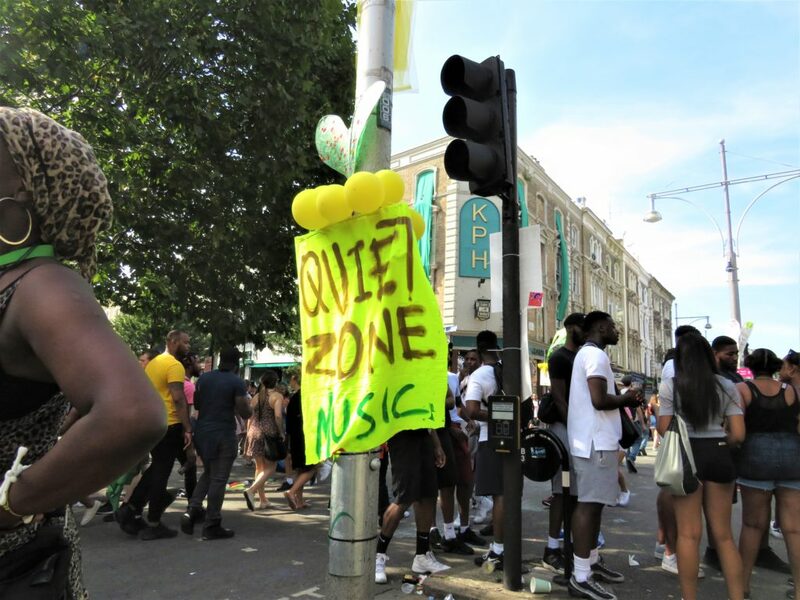 The quiet zone area of Ladbroke Grove is the closest to Grenfell, in the zone the floats passing through would stop playing music and the dancers would stop dancing as a sign of respect. 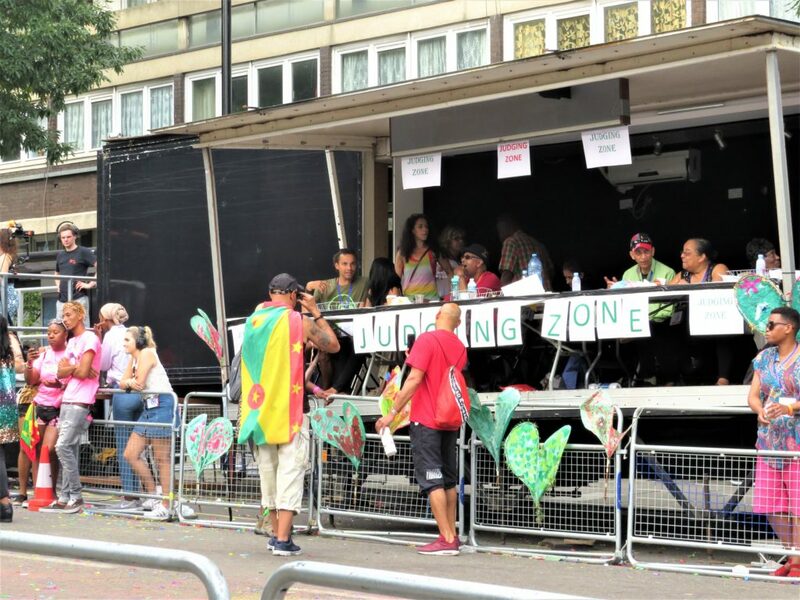 There was an area in the quiet zone that Carnival goers could go and pay their respects to those that lost their lives. It was very tastefully done! 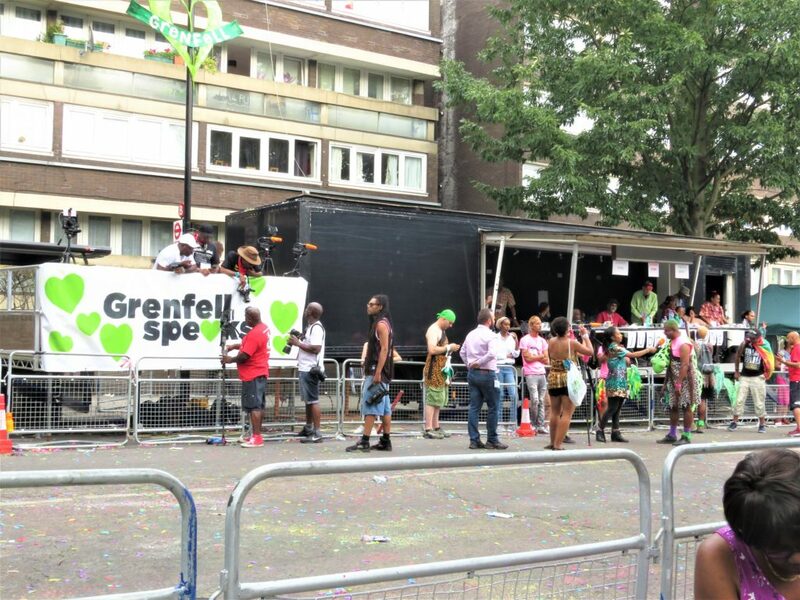 Carnival may of gone ahead but Grenfell had certainly not been forgotten, there where graffiti tributes on the wooden boards, floats had Grenfell theme floats, green balloons or signs and carnival goers came in green, Grenfell t-shirts or red, gold and green colours. It was amazing to see the love, support and respect shown for Grenfell. 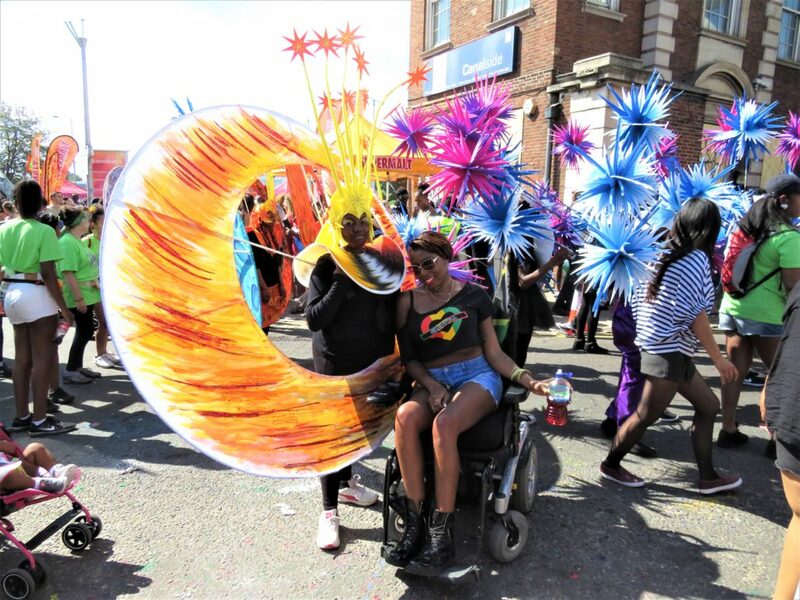 We wondered up Ladbroke Grove toward the Harrow road and when of the floats started playing music, we started dancing in the street as we followed the float. There is something infectious about the music you just want to dance. 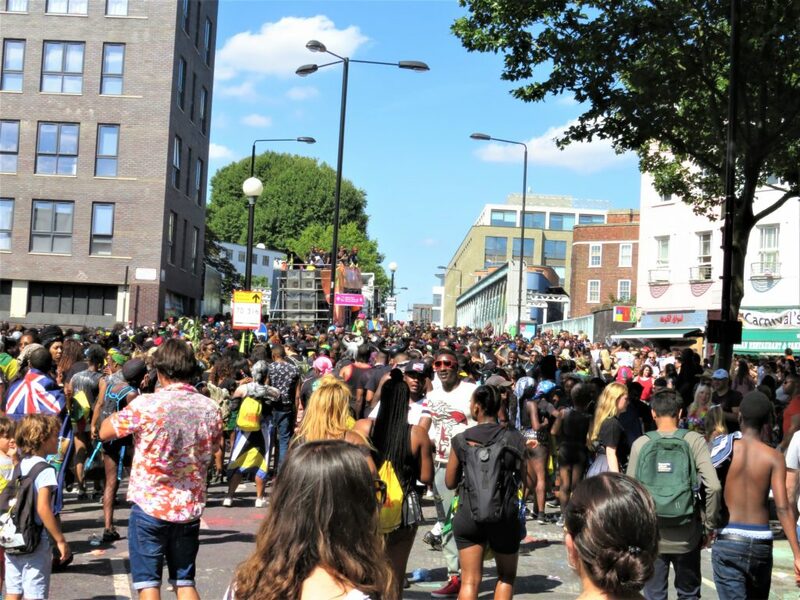 At the top of Ladbroke Grove, we watched the floats go by down Kensal road, it was there I met up with my sister and my 8-year-old niece. We were enjoying ourselves dancing to the music and watching the floats go by in the hot sun. 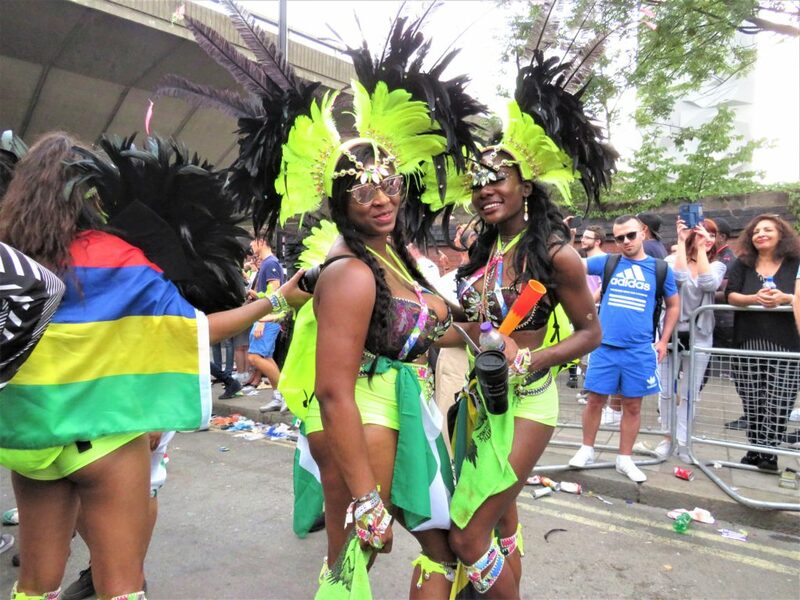 Carnival is a funny place there are thousands and thousands of people but you always end up bumping into someone you know unintentionally like a friend or family member, yet if you try finding some you are meant to find you can’t find them. 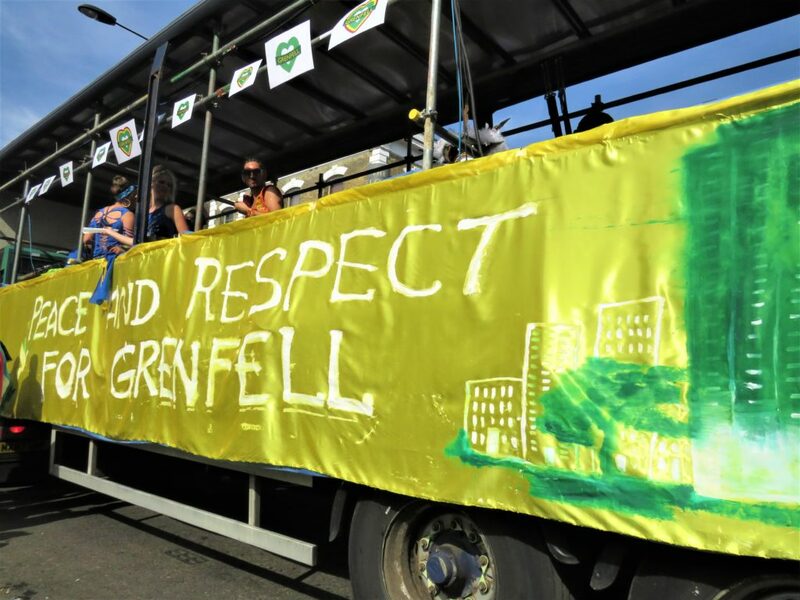 We decided to head down Kensal road and follow the floats, at 3 pm there was a 1-minute silence, for those that had lost their lives at Grenfell, which was respected by all. 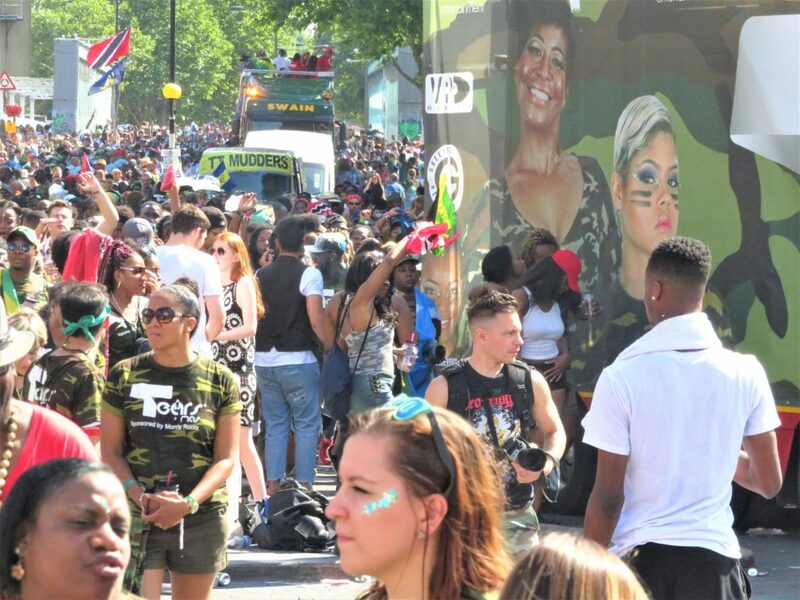 It was amazing to see Carnival go quiet, yet be full of people. 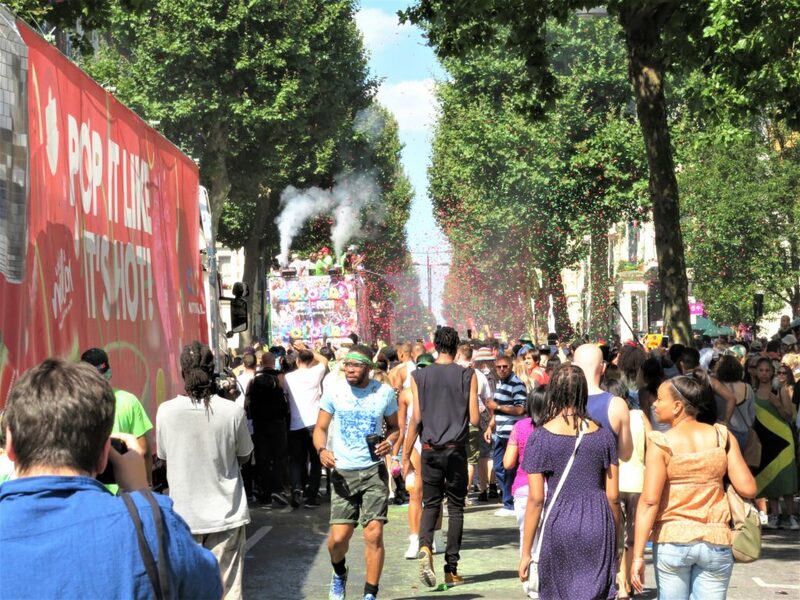 When the 1-minute was over, people blew their whistles, horns, clapped and chanted Grenfell. It was a beautiful moment! 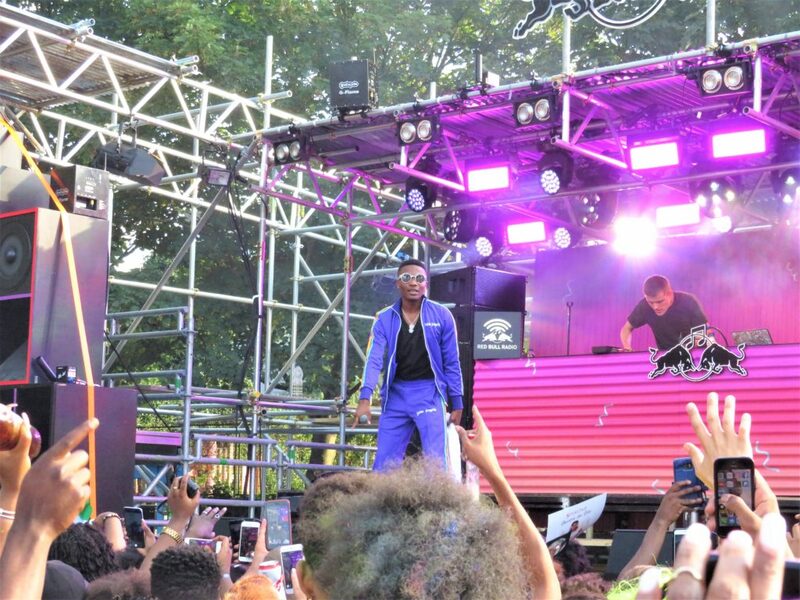 On Kensal road, there is a park which we went into, there was a Red Bull stage, where they were playing music and performers would come on. 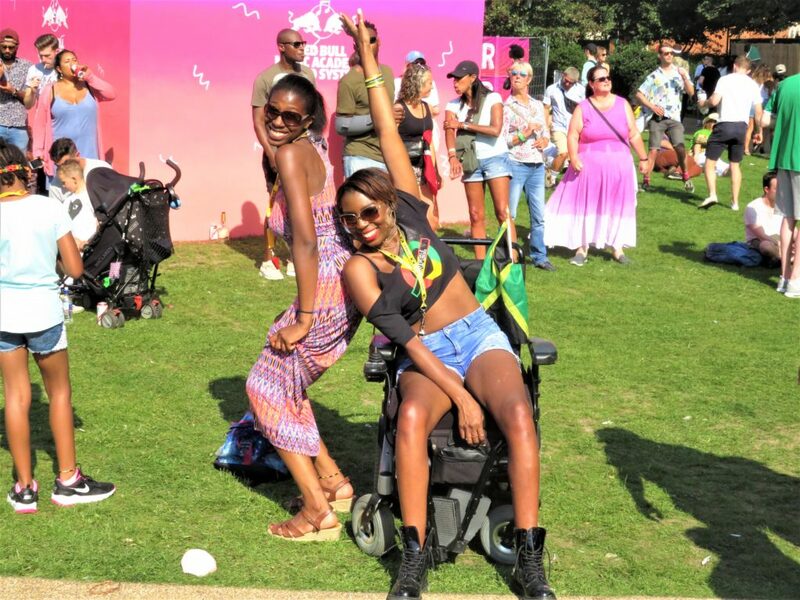 There were people dancing nearer to the stage and people sitting on the grass chilling in the listening to the music, it was like a festival in Notting Hill Carnival. 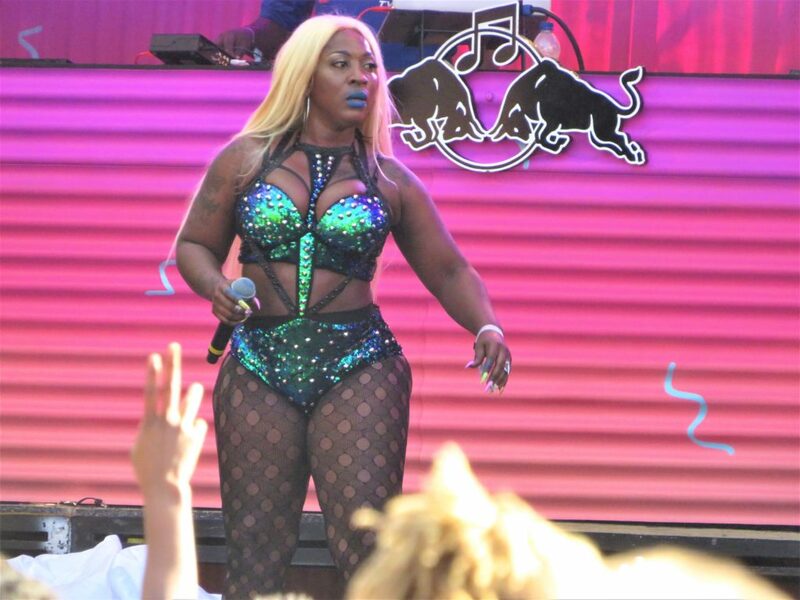 When they introduced Jamaican Bashment artist Spice to the stage the whole crowd went wild. 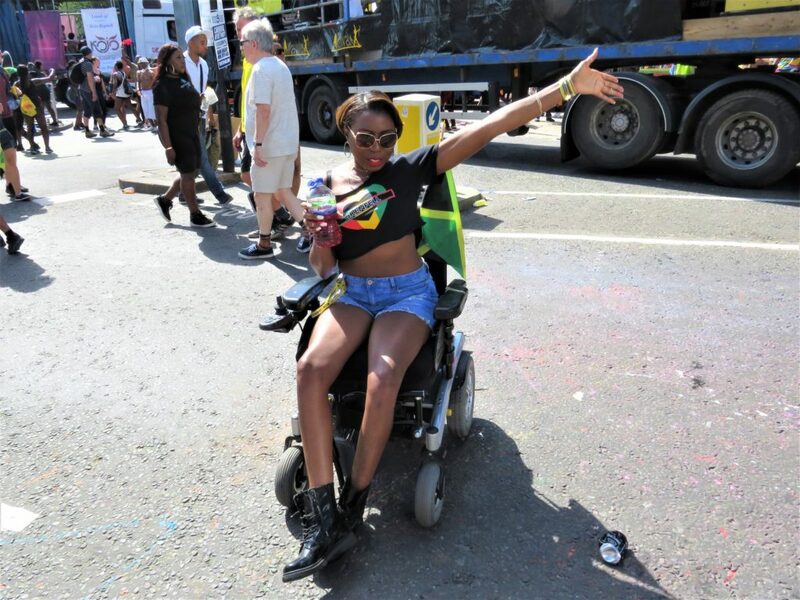 I couldn’t believe she flew all the way over from Jamaica to Notting Hill Carnival. Spice alongside her dancers gave a fantastic performance. 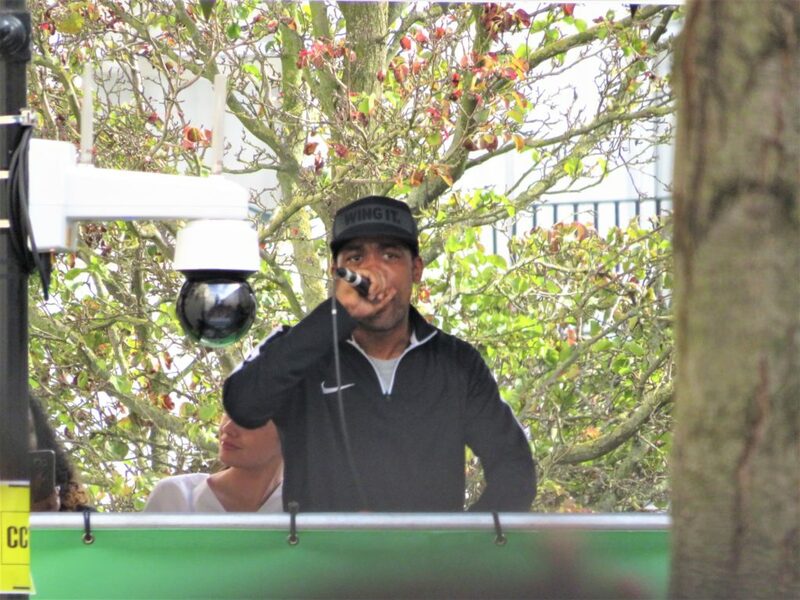 Then next on stage was Afrobeat artist Wiz Kid, it was amazing. He came on and sang all his hits and the crowd was singing along with him. He gave an excellent performance. It was around 6.30pm when we decided to make our way home, stopping off at static sound systems on the way. 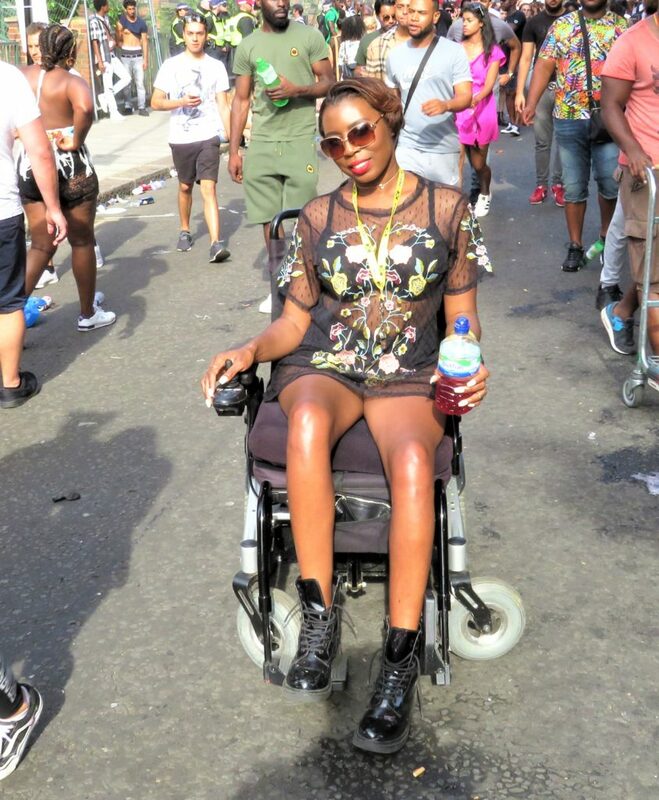 Carnival Monday, I had no plans of going but to be fair I said that last year and still went. The same thing happened again this year and in the end, we ended up going. We left out at the house to go Carnival just gone 3 pm, so we had missed the 1-minute silence. We wondered around carnival to various parts we didn’t go the day before, but it was very busy. We stopped and at different static sound systems and listened to music before moving on to the next. We then went and watched the floats near the judging point, before deciding to head back towards home. We only stayed about 3 hours or so, but I was tired and had no more energy, I had used it all up the day before. I just wanted to go home and relax! 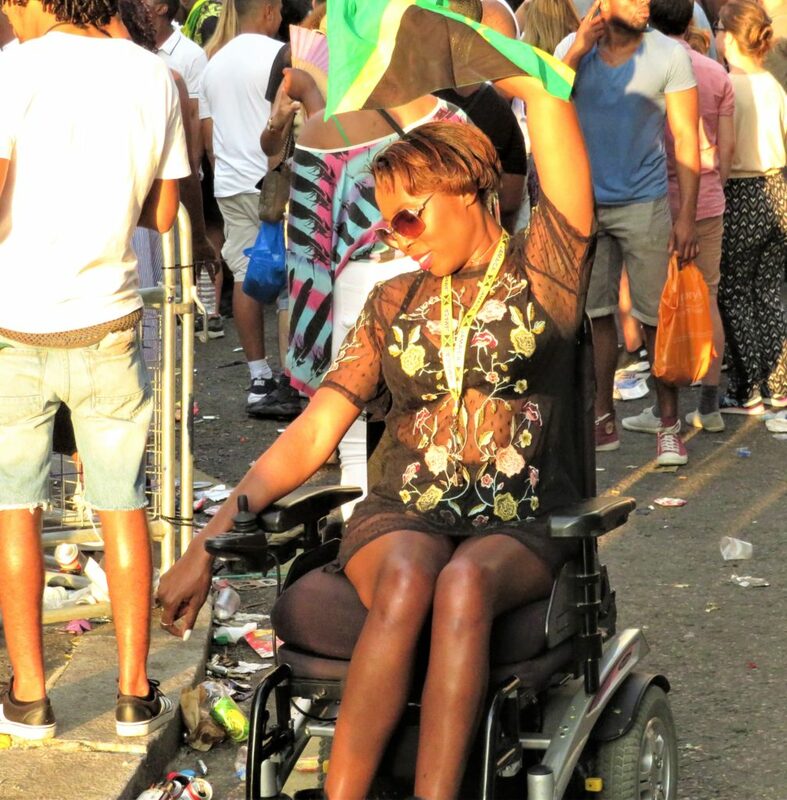 I enjoyed the Notting Hill Carnival more than I was going to this year. Even though I originally had no intentions of going, I am glad I went. 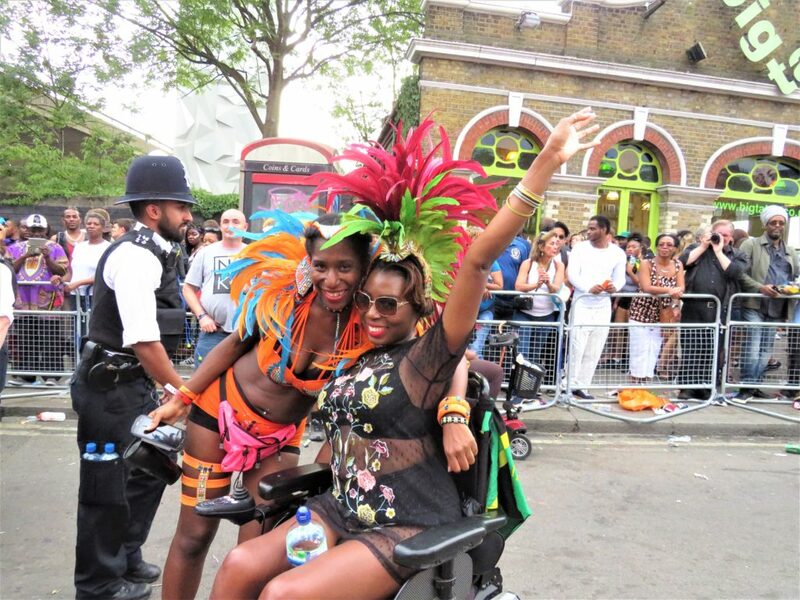 Carnival Sunday was amazing my highlight of the 2-day event. 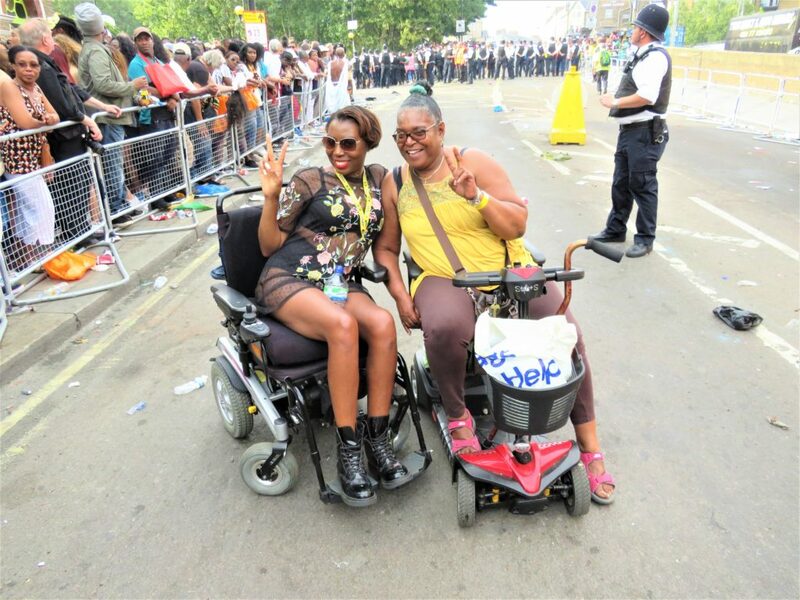 Understandably, the Notting Hill Carnival this year had a different vibe. 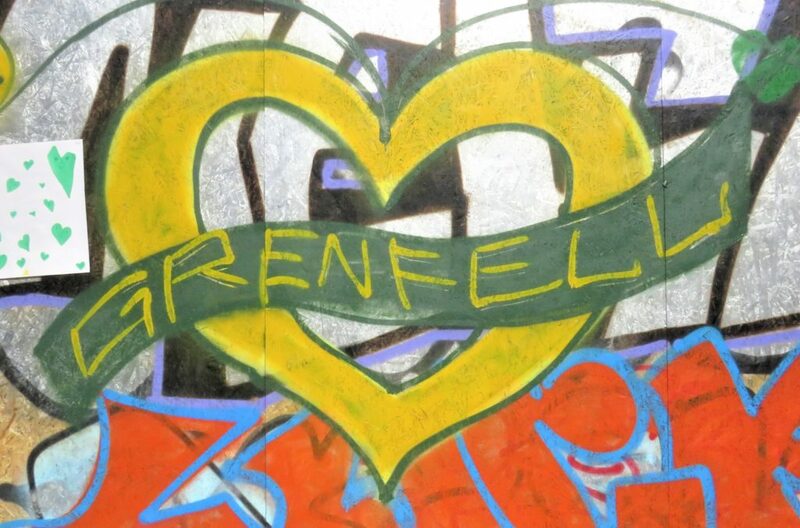 Grenfell was the main focus, and in the hearts and minds by those who took part or attendees. It was the perfect wake to those who lost their lives and was just what the community needed after such a tragedy. It was all about peace, love and unity to all.